There are sports deaths that sting in just about every city. Munson. Clemente. Piccolo. Bias. The whole Marshall football program. Well, today really stings Philadelphia, and Flyers fans in particular. 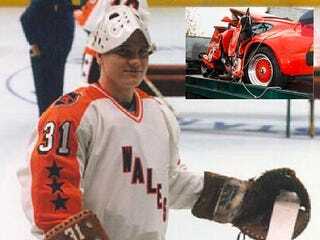 On Nov. 10, 1985, Pelle Lindbergh, a young goalie just starting to tap into Bernie Parent-esque potential, slammed his candy-apple red Porsche 930 Turbo into a wall outside a school at 5:41 a.m. at about 80 mph. The next day, he was taken off life support and declared clinically dead. No Flyer has worn Lindbergh's No. 31 since his passing. Though it is not available, the number has not been retired by the Flyers. After all these years, Lindbergh remains one of Sweden's most revered hockey figures. It's been a day of WIP sports-talk remembrances in Philly. Driving into Center City, I heard a fire chief describing the scene. He spoke about not knowing who the driver was (there were also two passengers) until he saw Flyers showing up at the scene. (Murray Craven was first.) He mentioned that if the car struck the wall about a foot away from the stairwell opening which it struck, Pelle probably wouldn't have died. Here's mine: Twelve-year-old me (in a No. 31 jersey) went to the crash site a week or so later. There seemed to be slivers of Porsche still in the intersection. I remembered asking my parents the day after the crash if Pelle woke up from the coma yet. Apparently, I didn't quite grasp brain death yet. I also remember that being the first time I'd heard about the perils of drunk driving. Granted, I can't say with any certainty if Pelle Lindbergh's death gave the MADD movement teeth locally, but I'm thinking it did. Yes, the whole thing could have been averted if even a modicum of personal responsibility had taken hold; I don't think anybody could argue that. Pelle was drunk and Pelle was speeding. But that doesn't make it any less tragic.